Snack Girl isn't really a fan of smoothies because she finds them too sweet. But, there is one style of smoothie that motivates her to get out the blender. And, something wonderful has happened and my regular grocery store (Stop-N-Shop) has started carrying frozen mango chunks! I am lucky enough to live near a Trader Joe's and they have always had frozen mango, but I didn't want to write about this treat because so many of YOU don't live near a Trader Joe's. I think what is happening is that the bigger supermarkets are figuring out that Trader Joe's has some great stuff and making sure they have it too. I have notice a bunch of items make the shift into the more established stores. So, I hope you are able to find frozen mango because it makes working with mango SO much easier. For $2.50, I bought a pound of frozen mango chunks and I knew EXACTLY what I wanted to do with them. 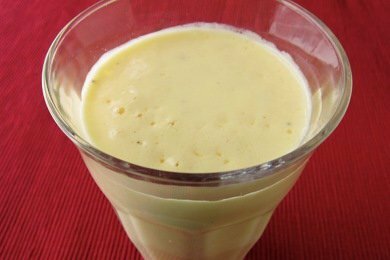 Make a Mango Lassi! Which is the South Asian term for "Mango Smoothie with Little or No Sugar". The first time I had a Mango Lassi was in an Indian restaurant and I was immediately "in love". Mango is the national fruit of India (great choice!). I believe Fruity Pebbles is the national fruit of the U.S.A. The yogurt-mango combo is amazing. You add salt, cardamom and maybe some lemon juice and you get an "adult" drink (without alcohol). This is a breakfast drink in India, and they will add pistachios to the drink to make it more of a meal. They also use ice cubes to make it cold, which is nice in hot climates. The frozen section of your supermarket is an excellent place to find fruit right now since so much of it is out of season (strawberries, peaches, blueberries). Just be sure that there is no sugar added to the fruit. You could thaw the mango and put it on your cereal in the morning (or mix it into your oatmeal). Or just eat it plain for a snack. Combine all ingredients in a blender and process until smooth. Pour into glass with ice (optional ice) and enjoy! Please share any mango recipes or favorite ways to serve them. Although we are snowed in, we will be making these for lunch today! I am so excited that I have all the ingredients already and my 12 yr. old daughter is excited! Thanks for this! Cut out all that unnesessary stuff and keep the mangos, the yoghurt and then add 1 dl of coconut milk (lowfat if possible) And one more mangorecipe: mango-"icecream": 2 dl frozen mango chunks,1 table spoon of coconutflakes, 250 g vanilla quark, mix this in a blender, pour into glasses and put in the freezer for 1,5 hour. Serve with fresh raspberrys on top. Serves 4. Have you tried green smoothies? They're only as sweet as you want them to be - add more greens and less fruit. Plus you get the much needed greens so many are deficient in. I'm enjoying a fabulous one right now! Frozen mango makes my world go round. I like to microwave it, mush it up, put it on whole grain toast for a warm not-too-sweet treat in the winter. Mango toast! @M - that sounds SO good. Thanks for sharing! Mmm... This sounds SOO good! I will have to try it! I started weight watchers shortly after you did your post about the new point+ program and I LOVE that fruit and most veggies are free. I've been eating SOO much fruits and veggies, I need to stock up on some frozen fruits, what a concept! Thank you again for all your wonderful ideas. I LOVE your posts. Costco and Sam's Club carry frozen Mango chunks along with other frozen fruits. It's nice to make smaller bags in the freezer for whatever you fancy for the day! I second the green smoothie notion! My day just doesn't feel right unless I start with one and it knocks almost all of my fruit and veggie requirements in one delicious drink. This morning I had peeled two kiwi, a cup of frozen strawberries, 6oz of pineapple juice, and a big handfull of baby spinach. Its almost better than my favorite of peach-mango. My basic fruit smootie rubric is a cup or cup and 1/2 of frozen fruit, 6 oz of juice, and a handful of baby spinach. I'm also thinking of adding a tsp of flax seed oil to them. Side note: I will be sad when the California kiwis go out of season in the grocery stores again. International ones are so nasty. I too have loved green smoothies. I don't even like juice...I have to put water in it to make it less sweet. I've noticed that since I've cut out sugars, I don't crave them and most things now taste too sweet. Luckily we can control the sweetness with the amount of juice and fruits we put in. A great alternative is almond milk and coconut milk. Smoothies are great meal replacements for those of us who have to shed a few pounds or are always on the run and can't prepare a nutritious meal. Keep up the good work Lisa and happy, healthy New Year to you! I never add juice to my smoothies, to keep the sweetness down. Mine are only fresh fruit and low-fat yogurt. I'm living in India right now but I have yet to have an official lassi. My husband often gets them with lunch, but it's more like a dessert for him. Love the cardamom in this. I'm a smoothie lover, add spinach or kale like commenters above and love to experiment. Ginger/flavored extracts like mint/herbs such as basil- the lid's the limit. I really like smoothies, because you can really add your spin on them. I'm going to have to try that mango lass, because mangoes are one of my favorite fruits, and it looks delicious! Why don't you like smoothies? I love them. They're my quick breakfast meals. Is this hefty enough to keep you full from breakfast to lunch? I'm not a pistachio person, so is there something else I could add to give it more heft so that I don't snack mid-morning? Yum! I am a huge mango fan and this sounds yummy. Does anyone have a recipe for smoothies with out yogurt? I love the idea of a fresh fruit smoothie but I am not a fan of yogurt. @Desiree - you can substitute milk for yogurt and it works great - just add some ice cubes to get a thicker consistency. Hmm...funny, my usual store doesn't carry frozen fruit--or I haven't been looking hard enough. Oh well, when it's mango season, I will have to try this recipe!